Chicken tenderloins are marinated in a summery basil kumquat vinaigrette and grilled, then served alongside grilled purple cauliflower steaks for a simple, yet inspired, summer dish. 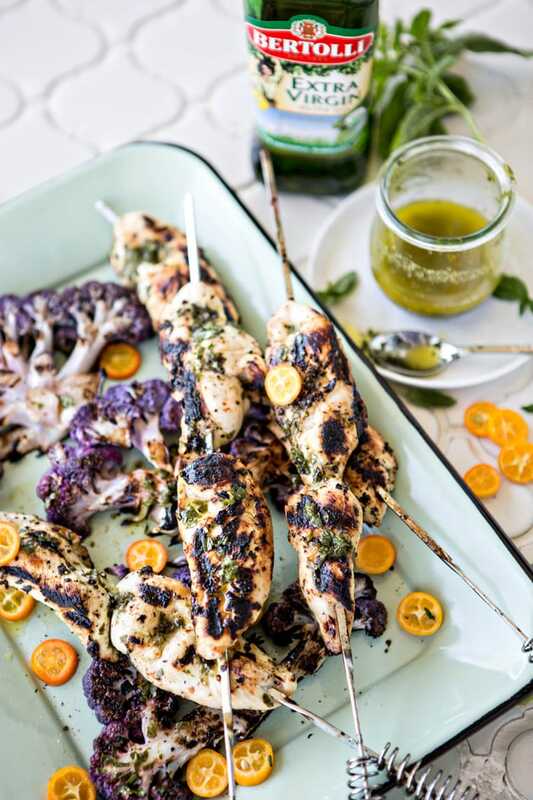 This recipe for Basil Kumquat Grilled Chicken Skewers with Cauliflower Steaks is created in partnership with Bertolli. Kevin and I have been hard at work with the finishing touches on our backyard landscaping as we prepare to have friends and family from all over in town for our anniversary party and a simple vow renewal ceremony, since only the kids were with us when we married last year. I made this recipe for Basil Kumquat Grilled Chicken Skewers with Cauliflower Steaks for us for lunch before we got started on yet another afternoon of labor. It was great to enjoy a quality meal and conversation together before the hard business of hauling rock and mulch all over the yard, as well as to provide our bodies with some great fuel for energy. 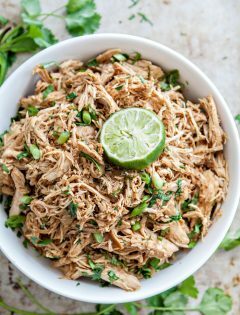 Lately, it seems like all of our spare time is spent working on the backyard, though I know that isn’t completely true because we’ve had plenty of play time as well as fun times experimenting with new, summer recipes. 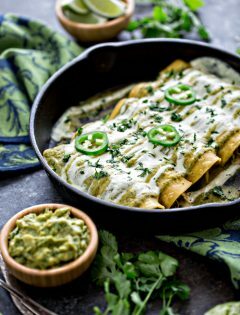 Simple, creative summertime dishes are my favorite to cook, eat, and photograph. I love the satisfaction and happiness that come from the simple act of cooking a recipe that isn’t complicated but that tastes really, really great, especially when I’m able to highlight seasonal ingredients. Summertime has me craving fresh, light, and simple, and those elements are what get me really excited about cooking and experimenting in the kitchen this time of year. There are so many seasonal flavors available that are just waiting to reach their potential in a new recipe or be used in a new way, like all the fresh basil that pairs so amazing with olive oil! 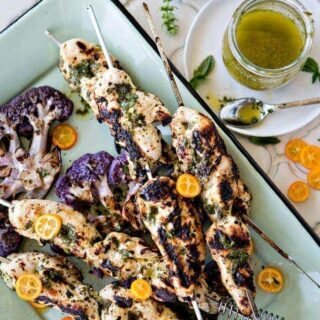 That is what this recipe for Basil Kumquat Grilled Chicken Skewers with Cauliflower Steaks is to me! It is so perfect for summer. Light and fresh. Full of flavor. So colorful and pretty for presentation (and for taking photos!). 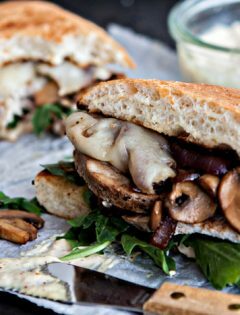 We use the grill a lot in the summer because it is a quick way to get a meal on the table without a lot of fuss or mess. Grilled meals usually don’t have a big, complicated process when it comes to preparation and that fits our life perfectly. It allows the simple act of cooking to be one that sparks joy in our life, rather than another item on a busy and long to-do list. Often times I am grilling the vegetables at the same time that I’m cooking the meat. Grilling adds a lot of flavor to vegetables in a very easy way, and it makes cooking and clean up a breeze! Even vegetables that you might not think about as being cooked on the grill, like this colorful purple cauliflower, can cook up fantastically. 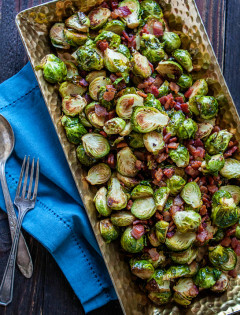 Plus, it offers a fun and unique take on the recipe by cooking an ingredient in an unexpected way. My best tip for cooking vegetables on the grill is to just toss or brush them with some olive oil, like Bertolli’s Organic Extra Virgin Olive Oil, and season with salt and pepper. 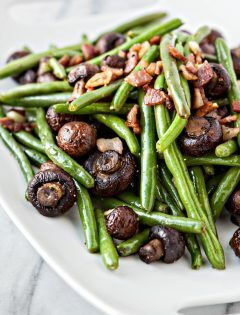 The flavors of the vegetables will speak for themselves, and be enhanced by the cooking process. 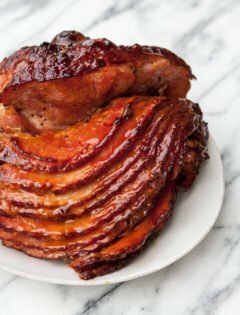 To cook meat quickly, I like using smaller cuts when I’m pressed for time or just want something easy. 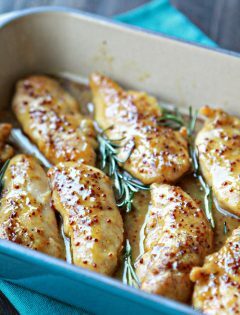 Chicken tenderloins are fast to grill and absorb the flavors of a marinade quickly since they pieces of meat are smaller. 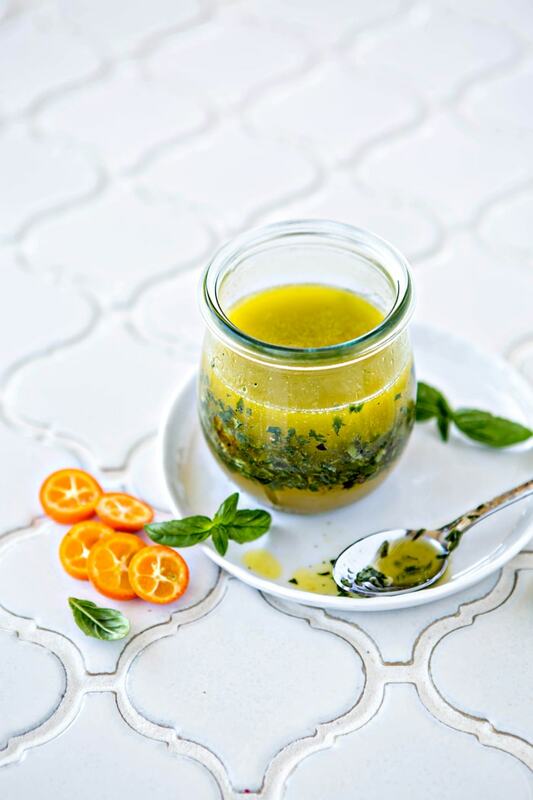 I decided to make a quick Basil Kumquat Vinaigrette that I could use for 2 elements in this recipe. Vinaigrettes are really easy to make, and are incredibly versatile – they aren’t just for salads. 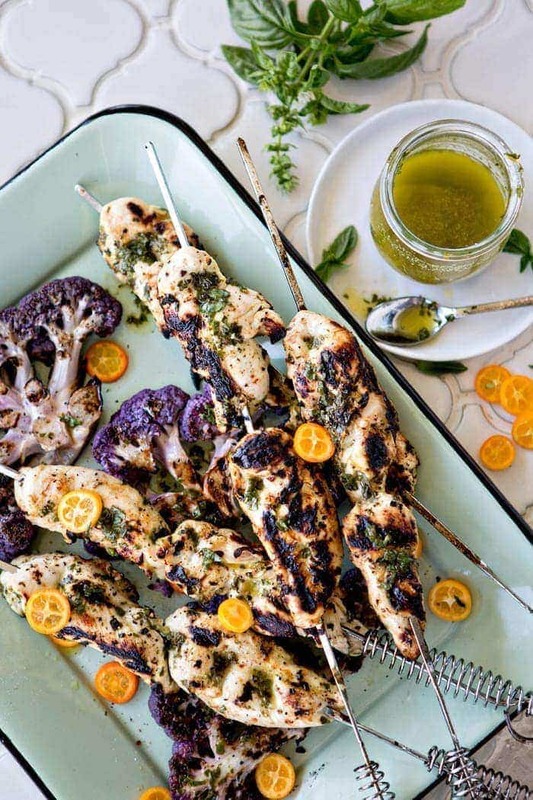 In this Basil Kumquat Grilled Chicken Skewers with Cauliflower Steaks, the vinaigrette serves both as a marinade and as a sauce for extra flavor post-cooking to really boost the taste to the next level (without adding extra steps or another element to prepare). The most important aspect of a great vinaigrette is to start with a premium-quality olive oil like Bertolli’s Organic Extra Virgin Olive Oil. 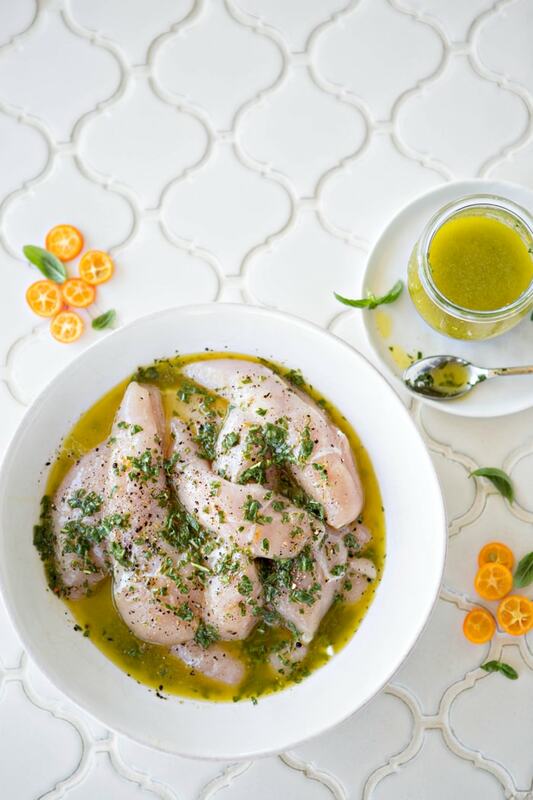 In this recipe, I relied on bright, summery tastes like kumquats and basil as accents to the olive oil to provide a big punch of flavor in a simple recipe. Did you know that Bertolli is the number one oil brand in the world with over 150 years of olive oil blending expertise? It definitely shows. The intense depth of flavor and quality of Bertolli’s Organic Extra Virgin Olive Oil shine through. Plus, I love how rich in monounsaturated fats that olive oil is. You can grab a bottle at any local grocery store near you or check out VillaBertolli.com. We aim to balance our lifestyle of fun, family, and friends with eating healthy (but tasty!) meals. Olive oil is definitely a big part of that in our cooking habits. 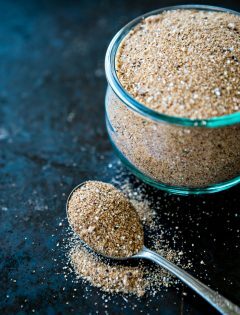 Even if we are serving an element of a recipe that is a little more rich, we are always trying to pair it with supporting ingredients or recipes that offer balance for our healthy lifestyle. I look forward to many more fun and fresh summer recipes. It is hard to believe summer is half over already, but there is still plenty of time for cooking and eating with friends and family, once we get our backyard landscaping done of course! What are your favorite ways to cook simply while sparking passion and creativity? Chicken tenderloins are marinated in a summery basil kumquat vinaigrette and grilled, then served alongside grilled purple cauliflower steaks for a simple, yet inspired, summer dish. In a mason jar, or container with a sealable, tight lid, combine the fresh basil, balsamic vinegar, olive oil, kumquat zest and juice, 1/4 teaspoon salt, and 1/8 teaspoon pepper to create the Basil Kumquat Vinaigrette. Seal and shake until well combined. 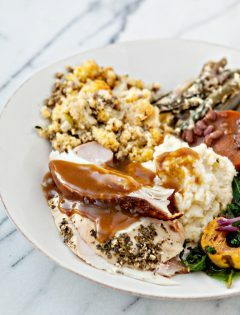 In a large, shallow bowl or a gallon sized zip top bag, combine half of the vinaigrette with the chicken. Allow to marinade for at least 30 minutes or up to 2 hours. Reserve the other half of the vinaigrette. Meanwhile, prep the cauliflower by washing and drying. Then, remove the leaves and excess stem. Slice from top to bottom in 1 to 1.25 inch thick sections for the cauliflower steaks. Do not remove the individual florets. Brush on both sides with olive oil, season (to taste) with salt and pepper and set aside on a plate. After the chicken has marinaded, remove it from the marinade (discarding the used portion). Thread the chicken on to skewers. 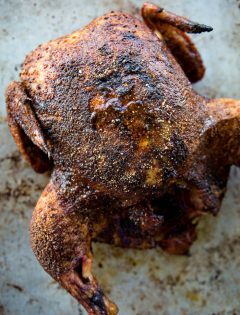 Grill over high heat, for approximately 3 - 5 minutes per side, or until the chicken internal temperature has reached 165 degrees, the juices run clear, and you have some nice grill marks. 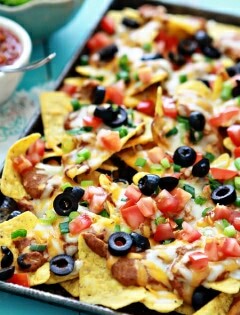 Set aside on a platter or plate and cover with foil and let rest for 3 minutes. 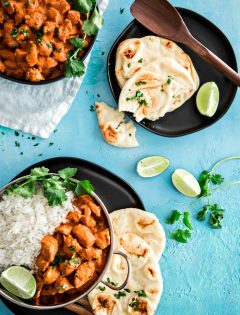 At the same time that the chicken is cooking, place the cauliflower on the grill and grill 3 - 5 minutes per side, or until the cauliflower is tender and slightly browned. To serve, place the cauliflower steaks on a large platter. Layer the chicken skewers on top of the cauliflower. Drizzle the chicken and cauliflower with 2 tablespoons of the reserved vinaigrette (saving any extra to serve along side for dipping if desired) and sprinkle with the sliced kumquats. 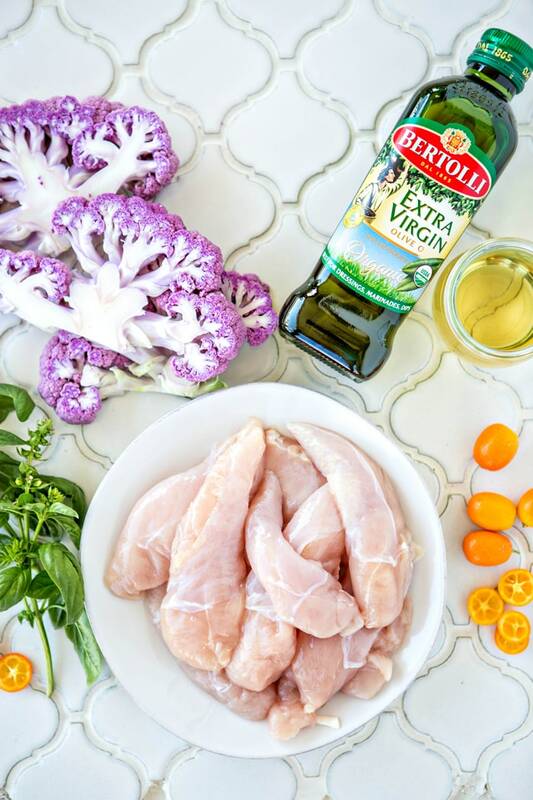 I’ve partnered with Bertolli to create this recipe for Basil Kumquat Grilled Chicken Skewers with Cauliflower Steaks. The opinions and text are all mine. 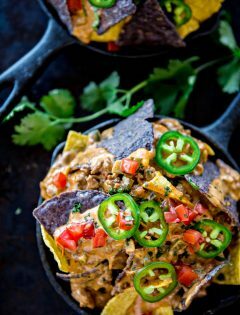 This is SUCH an inventive recipe! can’t wait to try it! Love that marinade – looks like such a fresh and light meal! What a unique marinade!! LOVE it!